Agendas in the classroom. Use them. If you are new to teaching, you’ve probably had dozens of veteran teachers tell you that having your daily agenda posted in a highly visible place is essential to having regular success in your class. They’re right, you know. 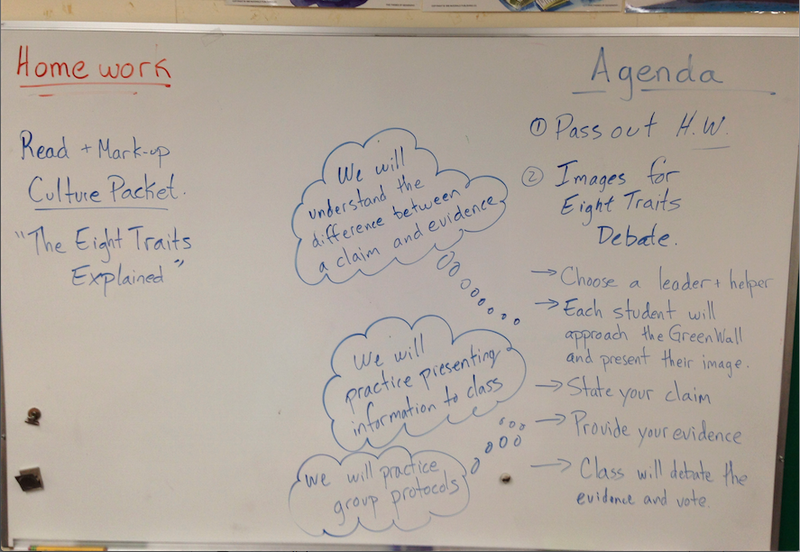 An agenda board is not just for your students to have a reference point for the day. It is a general framework for you to monitor you pacing, and a checklist to make sure that you haven’t skipped or omitted important information that pertains to your learning objectives for the day. What I would like to discuss is two fold. First I would like to take a look at some little tricks I use to organize the board itself that benefits everyone, including yourself. And, two, I’d like to present a case for having options in your agenda. When I say options, I mean that the agenda is now written in stone, it’s actually usually writing in dry erase marker which means that you should be flexible enough to allow for tangent conversation and executive decisions to change plans midstream, if needed. Let’s look at an agenda board I’ve used in the past. Agendas are a guide, not a bible to. In this example, the organization is simple. Homework is listed on the left and the daily agenda is on the right. Whichever format you go with, make a decision and stick with it for the entire school year. Students need to have some basic structure that is exactly the same. If you constantly change things up, some students will miss out on important details that might make the difference between understanding a concept or forgetting to hand in an assignment. As you proceed with your class, it is supremely important to be thinking to yourself what the students are getting and what they seem to be having a difficult time with. A good teacher will be able to monitor student progress through an activity while at the same time able to gauge overall comprehension and possible sticking points. Using the agenda board as a guide, a teacher can (and should) be prepared to halt a lesson in its’ tracks and drill down into a specific trouble spot. You don’t have to accomplish everything on the agenda board in a given day, in fact you might have your agenda board written out for 2-3 days on concepts and content. Being able to use your agenda board as a guide but not a bible is one of the super secret skills that you don’t learn in college. You don’t have to finish everything on your agenda every single day. If you do, that just means you are setting the bar too low for yourself and your students.